We hope you enjoy this brief yet informative Ponce de Leon biography while getting acquainted with our interesting history... Ultimately, the City of Ponce owes its name and symbol (the lion) to the legendary Spanish explorer and his family. 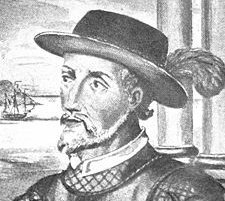 Don Juan Ponce de Leon was born in the Spanish province of Valladolid in 1474, and died in Havana, Cuba in 1521 at the young age of 47. An experienced soldier that participated in the 1492 re-conquest of Spain, he then joined Christopher Columbus plus some other 1200 sailor colonists for his second voyage (1493) to the New World. In 1508, while living in the neighboring island of Hispaniola, Spanish King Ferdinand II of Aragon gave Ponce de Leon permission for the first official expedition to the island of Puerto Rico, which the Spaniards called San Juan Bautista. This venture, consisting of about 50 men in only one ship, left Hispaniola on June 12, eventually anchoring in a bay near today’s capital city of San Juan. There, Ponce de Leon erected the first settlement in the island, known as Caparra and in 1509 he was appointed the first Governor of Puerto Rico by the Spanish crown. In March of 1513 he sailed from Puerto Rico with a small fleet of three vessels commissioned at his own cost and arrived April 2 at the coast of what he thought was the big island of la Florida, as he named it in honor of the Spanish Easter season (or "Pascua Florida"). The precise location of their landing on Florida's East coast has been disputed for many years. Depending on the Ponce de Leon biography that you find, some mention Saint Augustine, others a small harbor now called Ponce de Leon Inlet, and some even consider Melbourne Beach as the actual landing location. It was during this trip that they first experienced the powerful Gulf Stream which later became the primary route for East bound ships because of the strong boost it provided. Although Ponce de Leon is widely credited with the discovery of Florida, he may not have been the first European to reach the peninsula. According to a popular legend, Ponce de Leon "discovered" Florida while searching for the Fountain of Youth. Though stories of vitality-restoring waters were known on both sides of the Atlantic long before, the story of his searching for them was not attached to Ponce de Leon biography until after his death. In 1521 Ponce de Leon organized a colonizing expedition to Florida on two ships. It consisted of some 200 men, including priests, farmers and artisans, 50 horses and other domestic animals, and farming implements. The colonists were attacked by Calusa braves and Ponce de Leon was injured with a poisoned arrow. He quickly sailed back to Havana, Cuba, where he soon died of the wound. His tomb is in the Cathedral of San Juan Bautista in Old San Juan, Puerto Rico. Another interesting fact in Ponce de Leon biography is that he married Leonora, the daughter of an innkeeper and had three daughters, Juana, Isabel and Maria; and one son, Luis. The City of Ponce was founded in 1692 and named after the explorer's grandson (from daughter Juana) Juan Ponce de Leon y Loayza.